Written in 1787, ratified in 1788, and in operation since 1789, the United States Constitution is the world’s longest surviving written charter of government. See also Transcript of the U.S. Constitution. The members of the Constitutional Convention signed the United States Constitution on September 17, 1787, in Philadelphia, Pennsylvania. The present Constitution replaced the Articles of Confederation on March 4, 1789, when the first Federal Congress assembled in New York. The Federal Convention convened in the State House (Independence Hall) in Philadelphia on May 14, 1787, to revise the Articles of Confederation. Because the delegations from only two states were initially present, the members adjourned until a quorum of seven states was obtained on May 25. Through discussion and debate, it became clear by mid-June that, rather than amend the existing Articles of Confederation, the Convention would draft an entirely new frame of government. During that summer, in closed sessions, the delegates debated and redrafted the articles of the new Constitution of the United States. Among the chief points: how much power assigned or allowed to the central government, how many representatives in Congress for each state, and how these representatives should be elected—directly by the people or by the state legislators. The work, diligence and master creation of many minds, the United States Constitution stands as a model of cooperative statesmanship and the art of compromise. 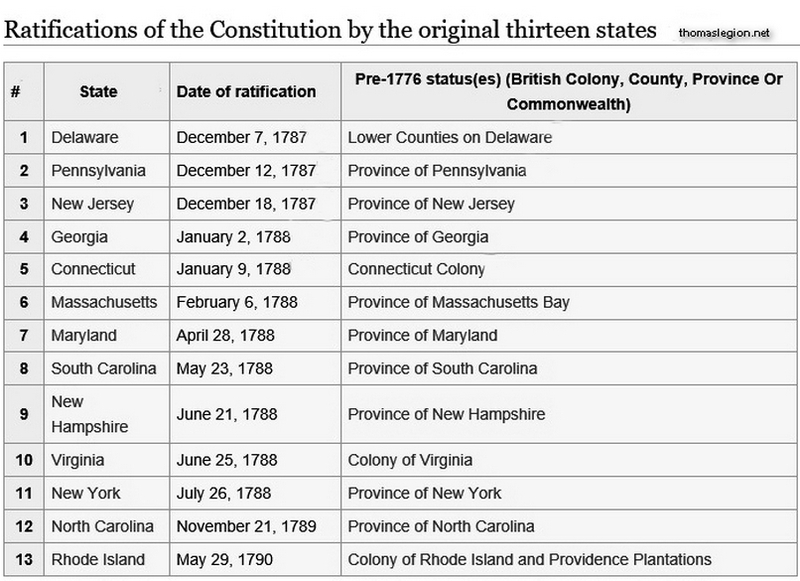 Less than three months after the U.S. Constitution was signed, the first state to ratify it was Delaware on December 7, 1787. New Hampshire was the ninth state, putting the Constitution into effect on June 21, 1788. Sources: Library of Congress, National Archives, U.S. Department of State, ourdocuments.gov, United States Senate, U.S. Government Printing Office. Recommended Reading: Original Meanings: Politics and Ideas in the Making of the Constitution. Description: Imagine, for a preposterous moment, that 55 national leaders convened to write a document to guide the country for hundreds of years. It seems unlikely--given that our current contingent of so-called leaders can't agree on how to balance a checkbook--that they could reach consensus on such issues as the allotment of congressional seats. The political and ideological issues that faced the creators of the Constitution were similar in some ways to those at play today. And in some ways they were vastly different ones. Jack Rakove, a history professor at Stanford University, has in this book framed the process that led to the drafting of the constitution in its historical and political context to offer insight into the difficulty of interpreting that most influential of documents. Recommended Viewing: Just The Facts - The United States Constitution. Description: Just the Facts: The United States Constitution is a superior video resource for history and social studies classrooms. Teachers and parents can use this to make the Constitution accessible on many levels. The program is targeted at junior high and high school freshmen and sophomores and is divided into sections corresponding to the articles of the Constitution. With contributions from experts on constitutional history and theory, the program lacks flashy production values but is nonetheless engaging. "...Outstanding for teachers and educators." Recommended Reading: The Complete Idiot's Guide to the U.S. Constitution. Description: The “living” document that changed the world. One of the most revered, imitated, and controversial government documents in the world, the U.S. Constitution serves as the foundation for the American government and shapes the lives of Americans every day. But how many know its history and the impact it’s had on American laws and practices throughout history? This guide serves as the most current and accessible handbook to this all-important document. —Covers the document itself, as well as controversial interpretations and decisions.